A week back, we got to know that Huawei will launch a smartphone with a display hole for the front camera in December. Then, there were rumors that Huawei is going to be the first to do so and not Samsung. 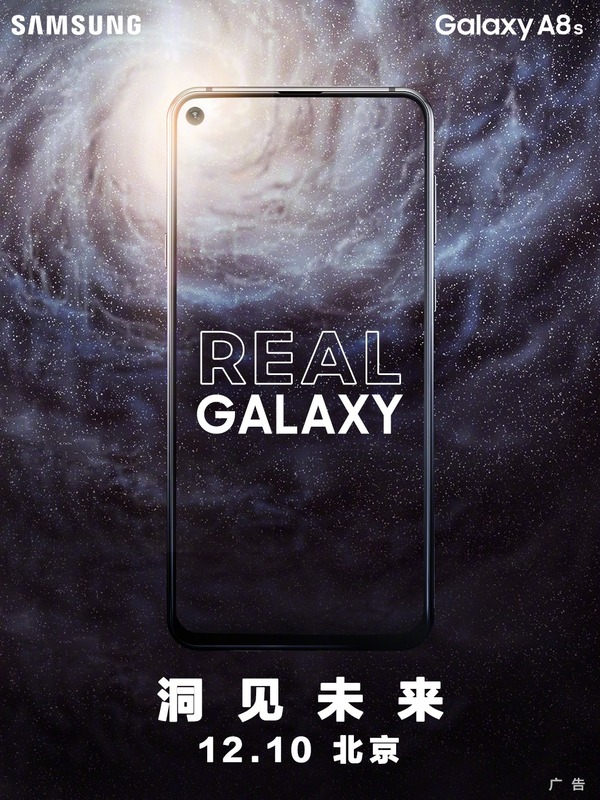 But today, Samsung revealed on its official Weibo page that the Samsung Galaxy A8s is launching in China on December 10, which means Samsung is going to be the first to launch a phone with a display hole. As the image above reveals, the Galaxy A8s has a thin bottom chin and an edge-to-edge design. There is no notch or chin on the top since the front camera is placed within the screen as we can see that camera cutout on the top left of the screen. The specifications of the Galaxy A8s are already known, and in case you missed our previous post on it, the Samsung Galaxy A8s has a 6.39-inch LCD Full-HD+ display, a Snapdragon 710 processor, 6GB RAM, 128GB ROM, triple cameras on the rear (24MP + 5MP + 10MP) and more. We hope the phone will launch globally soon after it is announced in China on December 10. FYI, the Nova 4 from Huawei with a display hole is launching on December 17, i.e., a week after Samsung announces the Galaxy A8s.